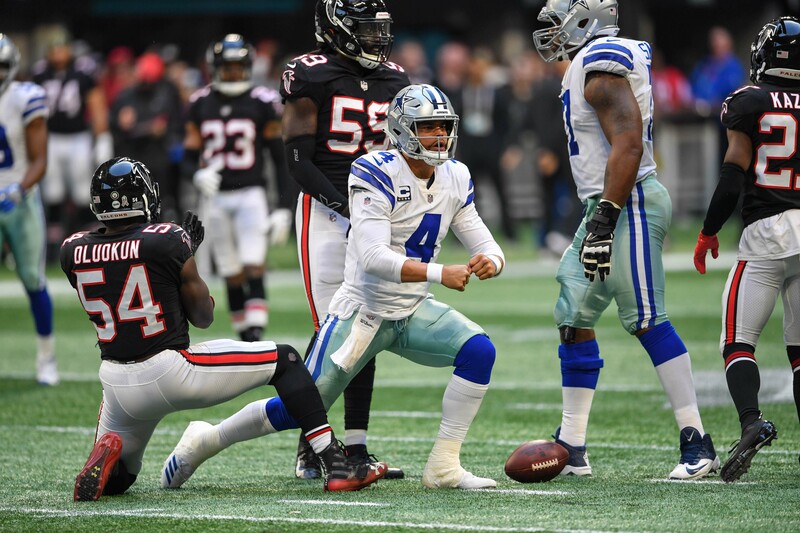 For the first time this season the Dallas Cowboys have won back-to-back games with a thrilling 22-19 win over the Atlanta Falcons. Hard to believe it was just two weeks ago that the Cowboys had lost their second-straight game to the Titans on Monday Night Football. Now, the ‘Boys are just one game back of the Washington Redskins who they play on Thanksgiving in just three short days. The ‘Skins will be without starting QB Alex Smith, who is out for the season after a gruesome leg injury that occurred during yesterday’s game versus the Texans. With that big divisional game looming in the background, the Cowboys are quickly relishing in their victory before turning their attention to Washington. Just like last week, Ezekiel Elliott went off rushing for 122 yards and totaling 201 yards for the game with one touchdown. Seems like the Cowboys winning formula hinges on No. 21’s performance. The #Cowboys are 4-1 in Leighton Vander Esch’s five starts for injured Sean Lee, and the rookie linebacker leads the team with 100 tackles and 2 INT. Leighton Vander Esch was a homerun first round pick, and…Amari Cooper was worth a first round pick. "We got a short week ahead of us playing the Washington Redskins at home on Thanksgiving. We're going to need everyone there for that game." The Cowboys will look to make it three in a row against the Washington Redskins on Thanksgiving.